Whew, the month of March has been a doozy for us and our stewardship and education programs! 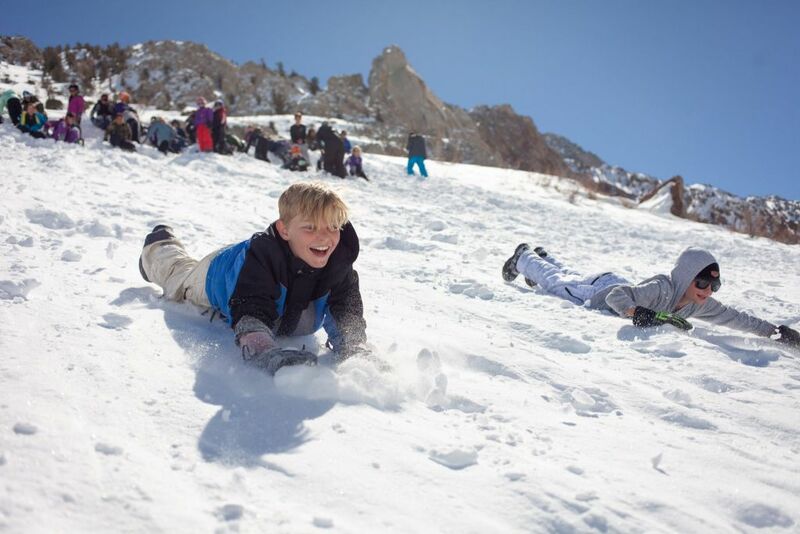 We started off with SnowSchool with the Bishop Elementary School fifth-graders up at Cardinal Village in Aspendell. 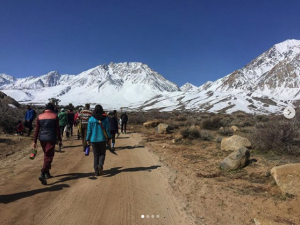 In partnership with the Eastern Sierra Interpretive Association, Winter Wildlands Alliance, the Eastern Sierra Avalanche Center, and the Eastern Sierra Land Trust, we engaged 150 students over three days in snow science, creative activities, and fun games. 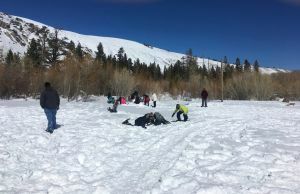 Bishop Elementary students enjoying a beautiful day in Aspendell. 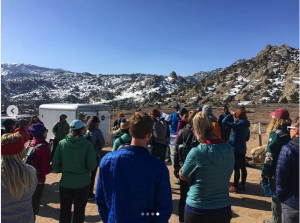 A mere week later, we headed a bit lower to our high desert ecosystem in the Buttermilk Country, for a morning of Stewardship with the Flash Foxy Women’s Climbing Festival. After enjoying our public lands during the festival, we had over 85 (!) 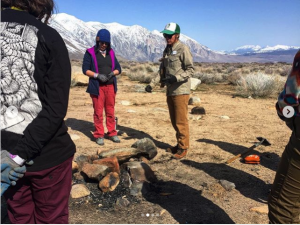 women join us in the Buttermilk for some trail and parking lot delineation, raking out of trespass, campsite and fire ring upkeep, and trash pickup. Thanks to the many hands, we were able to do a staggering amount of work, and definitely left the place better than we found it. Photo courtesy of ashventures_92 via Instagram. 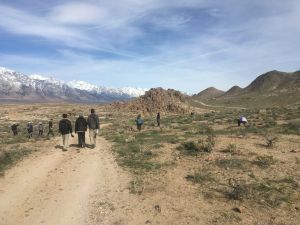 On the subject of leaving a place better than we found it, this past week I got to spend time with students from The Athenian School, doing a service project with the Bureau of Land Management in the Alabama Hills. 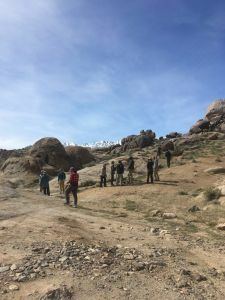 These 11th graders were on the tail-end of a 28-day backpacking experience, where they had hiked from various places in the Death Valley area; pretty cool! 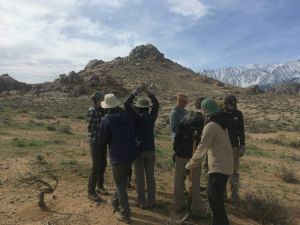 We got to tackle some vertical mulch projects out there in the Alabama Hills, and with 21 students and 6 staff (once again the power of people!) we were able to do some staggering work to try and discourage illegal vehicle trespass on sensitive high-desert ecosystems. 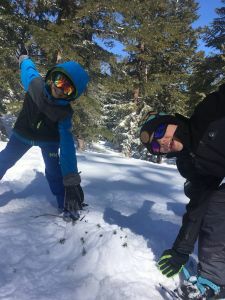 And finally, our jam-packed month culminated this week with our Mammoth SnowSchool activities at Mammoth Mountain Ski Area. 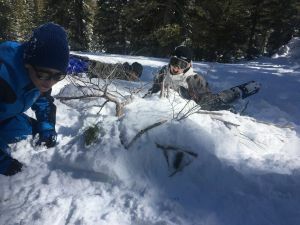 More fun was had, and some of the kiddos took particularly well to the “Creature Feature” exercise of creating their own creature well-suited for life out in the harsh winter climes. Here are some of my group showing off their critters! All in all, a busy month of getting outside, learning, and giving back to the land we love. And I wouldn’t have it any other way!